UNITY Theatre played host to three nights of preview shows last weekend, as a line-up of performers fine-tune their acts en-route to the Edinburgh Fringe. We managed to catch a selection of the comedy on offer and here’s our pick of the bunch. Adam Rowe calls his show Bittersweet Little Lies and it evolves from a story about the day his dad taught him it was ok to lie sometimes. Rowe can accelerate from deadpan delivery to full-scale rant in the blink of a lazy eye and uses skeletons from the family closet as the basis for much of his set. This is good solid comedy that hits its mark well and the honesty of the delivery belies the title. Tom Little used 31 Teeth in My Mouth as a title, but he’s already thrown this out and by the time it reaches Edinburgh it will be “Chicken Supreme? No, is isn’t”(probably). Whilst there are some well-judged comic pauses in his act, Little has his audience breathless following the seemingly random trail of weird and wonderful observations he makes. There’s nothing random about it though, as much of the material relies on convoluted construction and repeated links back to earlier segments. Here’s the sort of humour that builds laughs upon laughs – fasten your seatbelt. Brennan Reece closed the weekend with his show called Everglow, which he has recently brought back from Australia. Beware this sort of comedy, as it has a sting in its tail. There is a disarming frankness in Reece’s manner and he has a tremendous confidence, using the whole of the stage in a very physical way. What is particularly special, though, is the architecture of his material, which comes full circle in a hugely satisfying way and, startlingly, manages to bring in elements of pathos that are genuinely moving. Expect the unexpected with this one. 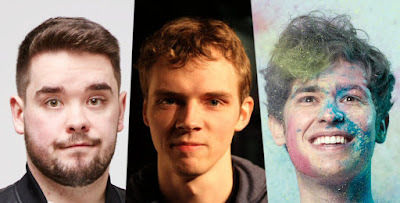 At this year’s Edinburgh Fringe, Adam Rowe plays The Caves at 17:20 from 5th August, Tom Little is at Nightcap at 13:10 from 6th August and Brennan Reece at Pleasance Courtyard at 18:00 from 3rd August.